View basket “HP 35s Calculator Programmed for the Electrical Engineering (Power) PE Exam” has been added to your basket. 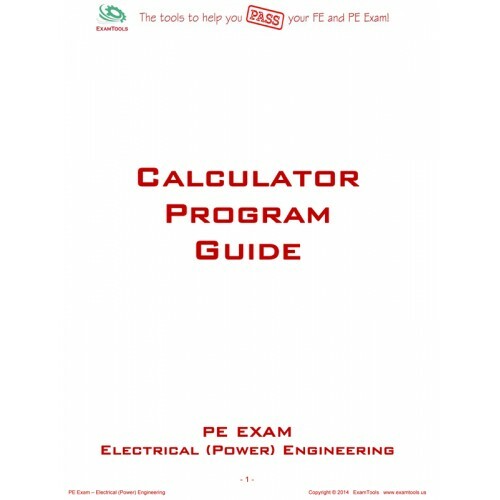 This guide book contains instructions for entering programs and equations for the Electrical Engineering (Power) PE Exam into your Hp 35s calculator. These programs and equations have been specifically designed for solving typical questions in the Electrical Engineering (Power) PE Exam. The guide book also summarizes the applications, variables, program text, and miscellaneous notes. The guide helps the user become familiar with the programs and equations and how they are used for standard question types. (Scroll to the bottom of this page to see the list of programs and equations) The guide book is the same version that is included with the programmed calculator package for this exam. The guide book is more than a list of equations to be typed into the calculator. It contains a combination of programs and equations, that are expanded to incorporate the calculation steps involved in standard NCEES questions. The programs and equations reduce multiple calculation steps into just a few key presses. In most cases you simply enter the variables presented in the question one by one, and out pops the answer! 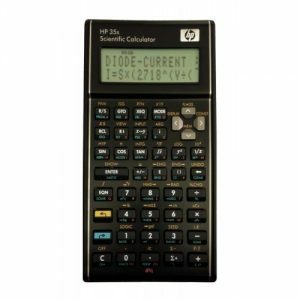 This product utilizes the HP 35s’ full programming capabilities, and applies them to your exam. This is significantly more valuable than just typing in equations copied from the NCEES Supplied Reference Handbook, or other published study aids. All of these programs and equations have been carefully selected, reviewed and tested by licensed professional engineers, and are guaranteed to be error-free. A lot of time has been spent developing and checking these programs and equations. The use of this product will provide greater accuracy and speed in tackling the numerical questions on the exam, and allow more time to be spent on the descriptive and abstract questions. The programs are designed to give maximum flexibility to accommodate uncertainty in the format of the information presented in a question and in some cases, diagrams are provided to clearly illustrate the parameters that are being calculated. Instructions for using the programs are very simple and intuitive, and the guide will not be needed during the exam. Your HP 35s calculator can operate in either RPN (reverse polish notation) or regular algebraic mode and all of the programs and equations in the guide book will operate in either mode. No programming skills are needed to enter or execute any of the programs. The instructions provided are very simple and the user will not have to refer to the HP 35s User’s Manual. Please refer to the feedback comments from PE candidates who have recently purchased this guide book and used it in recent examinations. The ExamTools EBAY account has 100% positive feedback. Many users have indicated that they probably would not have passed the exam without the help of this programmed calculator. The guide book will be provided in electronic format immediately upon ordering, and the printed version is shipping is by USPS Priority Mail. All items are shipped out within five days of receipt of payment (usually within two days), and all shipments are insured by the carrier or guaranteed by ExamTools. , and include a comment that you are sending your own calculator in for programming, for the Electrical Engineering (Power) PE Exam.